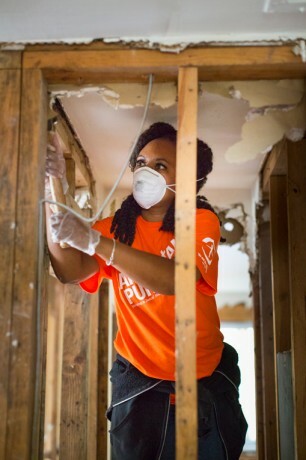 As Samaritan’s Purse volunteers work in homes throughout Columbia, South Carolina, they share the hope of Jesus Christ, even in the midst of stormy weather. Despite a powerful early-morning thunderstorm and a late-day downpour, more than 200 Samaritan’s Purse volunteers circulated throughout Columbia on Saturday to assist homeowners cleaning out their flood-damaged homes. And, our volunteers did far more than just manual labor. Joined by Billy Graham Rapid Response Team chaplains, they encouraged and prayed with homeowners, ministering in Jesus’ Name to those who continue to struggle with great loss following the recent epic rains. On a typical day, teams disperse to homes shortly after 8 a.m. following a safety orientation at our host church—Shandon Baptist Church—but a strong cell of thunderstorms with flashes of lightning delayed their Saturday departure by about an hour. Once the storms passed and the green light was given, teams caravanned to their work destinations. To date, nearly 70 homeowners have requested assistance from Samaritan’s Purse, and the word is spreading that we’re here to help. Frank Lodato, whose home in New Orleans was destroyed by Hurricane Katrina in 2005, drove to Columbia with his 15-year-old son Jackson. Frank could empathize with the struggles that the homeowners are facing, and he wanted to reach out as a Samaritan’s Purse volunteer and serve in Jesus’ Name. That door opened at the home of Vince and Sabrina. “I wanted to not only help them clean up their home, but I really wanted the chance to encourage them, that this season—as difficult as it is—will not last forever and they were going to be OK,” Frank said. 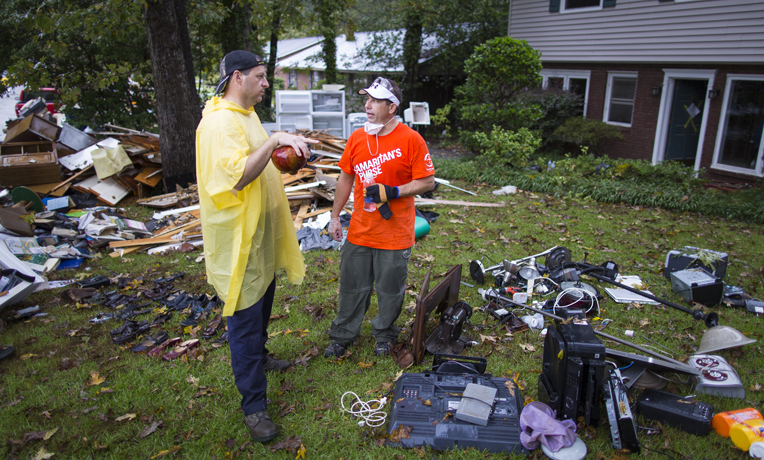 Samaritan’s Purse volunteer Frank Lodato lost his home during Hurricane Katrina. Now he is in Columbia to help homeowners, including Vince. As Vince and Sabrina were surveying their waterlogged possessions piled along the curb in front of their house, Frank walked up to the couple and asked how they were holding up under the stress. With a light rain falling, they talked for about 15 minutes, and Frank shared how he managed during the weeks that followed Katrina. He shared with the two that he and his wife were praying for them. Vince and Sabrina graciously thanked Frank for his words of kindness. 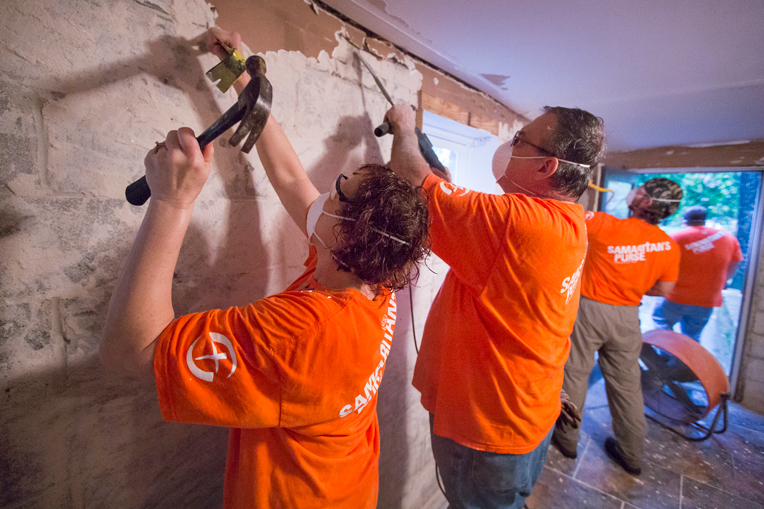 Samaritan’s Purse volunteers are hard at work helping homeowners throughout Columbia as they recover in the wake of serious flooding. Vince said he was deeply grateful how Samaritan’s Purse came alongside them and performed their work with a high level of expertise and excellence. 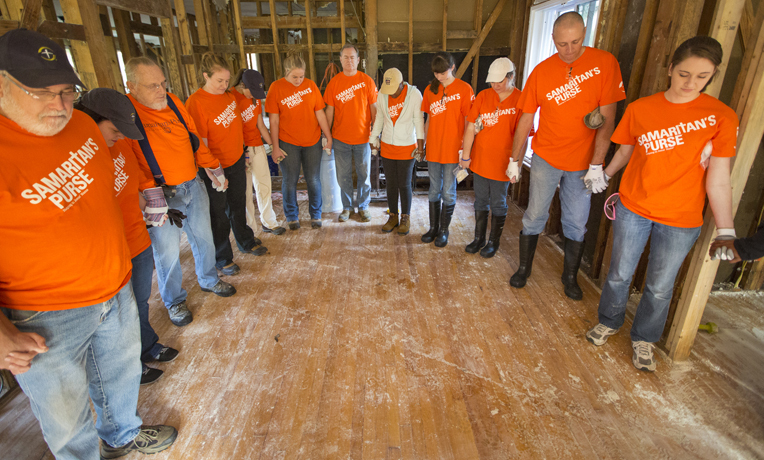 Volunteers tore out waterlogged walls and floors, gutting two floors of their tri-level home, so that a contractor can eventually come in at a later date and rebuild. Volunteers also worked at Paul’s home, Vince’s next-door neighbor. The lower level completely filled with floodwater up to the second floor. In another hard-hit section of Columbia, Earl and Cynthia expressed a similar sentiment. 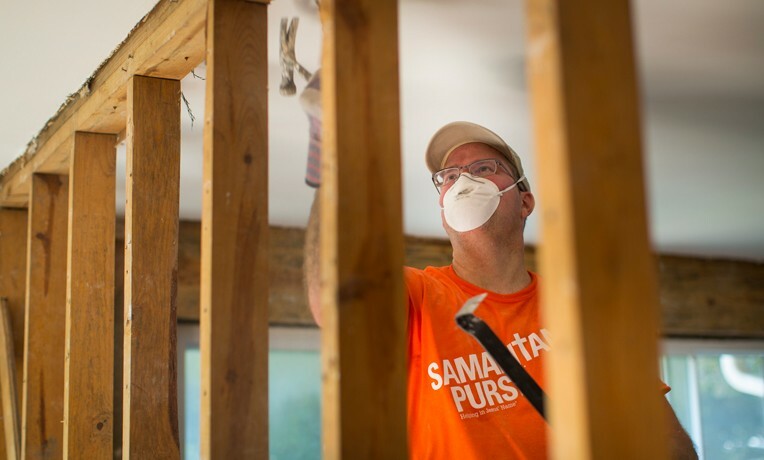 Samaritan’s Purse volunteers worked at their ranch-style home, which was ravaged by muddy floodwaters more than five feet deep. Even though the flood wreaked havoc in their lives, Cynthia said that God has enabled them to focus on their neighbors and their need for Jesus. They were especially thankful—and excited—that Samaritan’s Purse was active in their devastated neighborhood.